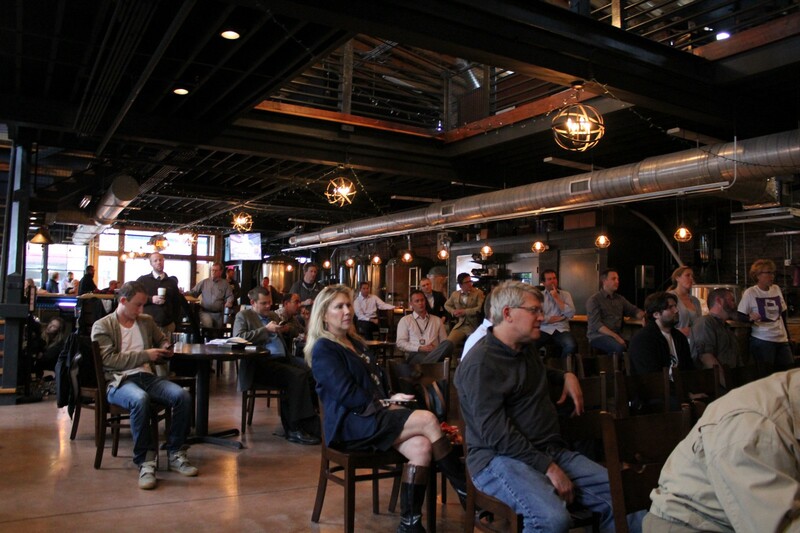 The monthly gathering of Networking for Entrepreneurs in Wilmington (NEW) met the evening of April 12th at downtown Wilmington, NC’s Ironclad Brewery. Featuring business and entrepreneurship panels, this month presented David Gardner, founder of CoFounder’s Capital Fund and one of the most active angel investors in the region; and Justin Miller, the founder of Deja Mi and WedPics, one of the rising startups in Gardner’s portfolio. From North Carolina’s Raleigh area, they visited Wilmington specifically to bring insights to the Port City based on their experiences from both the investor and entrepreneurial sides of the relationship, respectively. The forum style was panel moderated by Merrill Mason of Smith Anderson Law, a founding member of the Council for Entrepreneurial Development (CED). David and Justin gave the audience many tips and reminders that can make vital changes for entrepreneurs. There were three very important takeaways from this panel. Much of the dialogue revolved around the investor and entrepreneur relationship stages of the mutual journey. This relationship, they explain, begins long before any commitments are put to paper. “It’s very tempting to accept anyone that comes with the offer of money, especially in the earliest days of a startup trying to gain traction or even stay alive.” David confessed that in his first 25 years of being the one asking for money, he made some hasty decisions when accepting investors. In retrospect, he advises entrepreneurs to be as picky with their investors as investors will be with them. In short, whenever you give away equity, make sure you get more than money in return. An investor with a large network of potential customers or experience launching similar businesses is much more valuable than one that only brings a check. Inspired by the idea of recording the full experience from all aggregated photos and videos from a single concert event, Justin Miller left IBM’s creative department to launch Deja Mi. He was his own target audience and knew how to find the people he would market the app to, but the app failed to get serious traction. Responding quickly to keep his business alive, he explored all of the verticals he could best move his idea and progress toward and found that weddings came up every time. Through WedPics — the name after Deja Mi pivoted — the entire wedding experience could be recorded through smartphones instead of through disposable cameras that wedding parties generally distribute during receptions. Since her wedding day is the one day a bride is guaranteed whatever she wants, that made her the key influencer for the sale. Once she is sold onto the app, by default so is the rest of the guest list. Similarly when investing in Stealz, a university loyalty card app startup based in Raleigh, David Gardner did his due diligence to locate where his traction would be. Jeff Brock, an investor with experience in restaurant deals and an impressive rolodex of industry contacts, was brought on as an advisor. Together they targeted location after location determining interest and cost of sales acquisitions. After determining that each sale came at a financial loss, they targeted local franchise restaurants. This move proved intelligent as success for their app propagated up the chains, eventually leading to their adoption at both Taco Bell and McDonald’s. This, only because they placed their app in the hands of those with leverage to pitch it to the right stakeholders. Like many first time entrepreneurs, Justin Miller had no idea what he was doing when he started WedPics (neé Deja Mi) and had self proclaimed “delusions of grandeur” when pitching to investors. Reality contrasted starkly against idealized expectations of a flooding user base and $5 million in his first year. Gardner points out not to rely on fortune telling, but rather to use past performance as the most reliable indicator of future events. Review your business plan monthly and measure predictions against actual performance numbers. This isn’t merely to give means to cry yourself to sleep. Rather, it allows insight to readjust actual performance. What’s most important about this point is the call to action, exercising it, and often. Passion and problem solving are very often described as being key skills in entrepreneurship, but the above points cover two other important topics: performance and potency. They remind us to fully utilize our human capital, including our investors, to identify the most powerful sales audience and how to take the guesswork out of predictions. The next NEW event will be held again at Ironclad on May 19th with a new panel and more crucial information..